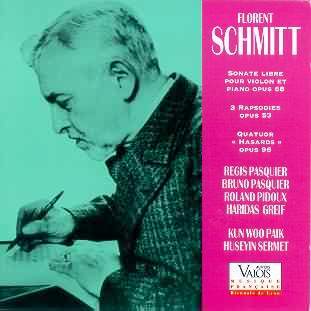 Schmitt was a very close contemporary of Vaughan Williams and in an occasional pastoralism there are some parallels between the two composers. The two are pictured together in OUPs pictorial biography of the British Composer. The Sonate Libre is a free-wheeling violin sonata in two lanky rhapsodic movements over a 30 minute span. It dates from the years just after the Great War ended and was written in the Pyrenees. It is a spiritual cousin of Herbert Howells' Piano Quartet though ultimately much freer and wide-ranging in its impressionism and bejewelled sounds. Frank Bridge's more impressionistic chamber works (pre-1920s) also come to mind. The big tune can be heard in full unfolding splendour from 8:20 (Track 1). To the British voices can be added the influence of Ravel and Debussy. There is none of the oriental grandeur of his big set-piece scores such as Psalm XLVII or Tragédie de Salomé. The Animé second and final movements are full of delicate fantasy in a voice familiar from Ravel's Mother Goose and, for those who know it, Josef Holbrooke's Sonate Orientale. At 15:02 Schmitt brings us full circle with a recollection of the strikingly nostalgic theme from the first movement. This is a sort of Lark Ascending ... but over the Pyrenees. The Three Rapsodies (1903) for two pianos are 'picture postcards' of France (a Chabrier-emulating valse), Poland (a Chopin-type mazurka) and Vienna (a Johann Strauss waltz) in 23 minutes. These offer classic bon-bouches for both performers and listeners. The music is not profound but deft and colourful, sounding like a cross between Godowsky and Saint-Saens. Schmitt wrote a large number of works for this medium. He orchestrated the present set and the Rapsodie Viennoise became a popular concert item. Claude Michel and his associates are embarking on an 'intégrale' spanning the complete two piano/piano duet output over 15 CDs. Hasards is a 4-movement piano quartet (circa 15 mins) dedicated to another neglected hero of the French musical renaissance, Guy-Ropartz. It was premiered in 1943. The work is fey and flighty, influenced by Ravel's string quartet, the first two (of 4) movements especially. The third is a twilight berçeuse in the hinterland between sleep and waking. In this work Schmitt often made me think of the chamber music of Arnold Bax. The final Bourrée is marked 'impétueux' and there is a heady dash and intoxication to the proceedings and to the jerky hiccuping theme which unfolds in Howellsian majesty at the close. I am not familiar with these works in other performances but the artists here seem completely engaged and concentrated. Recommended for the Schmitt explorer, the French music enthusiast and the chamber music fan who would like to push the boundaries of her or his knowledge outwards into unusual territory. Rewarding and varied listening. An excellent production by Auvidis Valois. More please. NOTE AND PLEA When will someone record Schmitt's impressive Introduction, Récit et Congé a 25 minute work for cello and orchestra. It is one of the few orchestral works by Schmitt which has not as yet been recorded commercially.